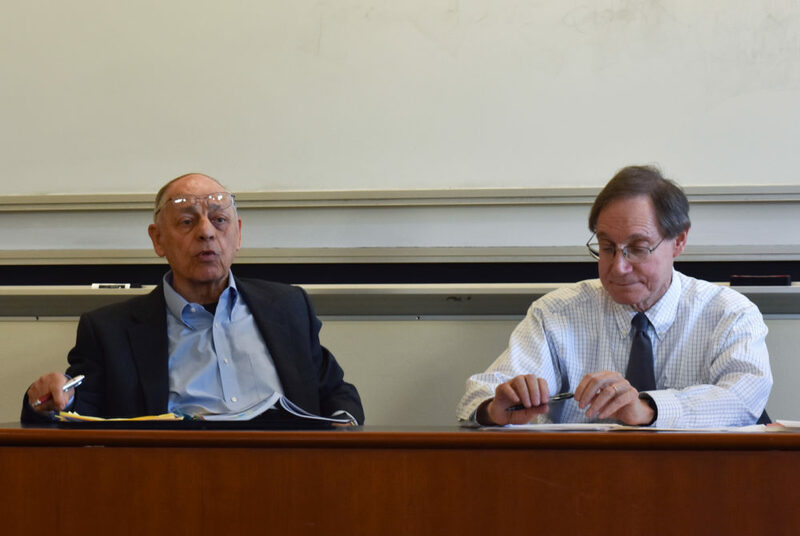 Mike Lemov, left, the former general counsel at the former National Commission on Product Safety, and Robert Adler, a commissioner at the Consumer Product Safety Commission, discuss consumer safety regulations at an event at the law school last week. Updated: March 20, 2019 at 11:45 p.m. Experts in consumer product safety discussed the importance of consumer safety regulations at the law school last week. Mike Lemov, the former general counsel at the former National Commission on Product Safety, and Robert Adler, a commissioner at the Consumer Product Safety Commission, talked about the role that consumer safety regulations play in the lives of Americans. Lemov, who worked at the CPSC’s predecessor, recounted congressional efforts to create a government agency dedicated to protecting individuals from death and injury caused by consumer products. Lemov said media coverage of people who were hurt or killed by products – like a man who was paralyzed after diving into a poorly constructed swimming pool – provided consumer safety advocates the momentum needed to obtain congressional authorization for the NCPS in 1967. Five years later, Congress passed the Consumer Product Safety Act of 1972, replacing the NCPS with the CPSC. The commission was given a broad mandate to regulate consumer safety, Lemov said. The panelists then discussed the ways that consumer protection has changed since the creation of the CPSC. Adler, a commissioner at the CPSC, discussed the positive impact of consumer protection, referencing the history of children suffocating inside of refrigerators prior to the implementation of CPSC safety standards. Other CSPC successes include a 72 percent reduction in electrocutions, a 51 percent reduction in residential fire deaths and a 92 percent reduction in crib deaths since the commission’s launch, Adler said. Adler also discussed the future of the CPSC as technology continues to progress. He said major technological advances have yet to result in widespread consumer safety incidents, but it is possible that future developments could yield safety concerns. Adler also acknowledged that while certain types of technology pose a threat to consumer safety, technology also plays a role in advancing safety regulations. “As technology advances, my argument is that things that one day were considered perfectly reasonable risks are not going to be considered perfectly reasonable anymore,” he said.